QR code, which stands for “Quick Response” code, is the latest trend to infatuate marketers and is helping to reshape lead generation techniques, add some spice and color to a campaign, or just have some flat-out fun. Originally used in Japan car factories to track parts, QR codes have the same functionality as bar codes, but can hold much more data because they are two-dimensional – contrast 30 pieces of data with 7,000. In other words, a lot of information can be transmitted to direct people to a destination of a marketer’s choice, including – a web site, contact page, text message – the possibilities are endless. QR codes have become popular in the past year due to the rise in smart phones and downloadable QR reader programs (warning dumb phone users: do not try this at home, or anywhere for that matter). My first take on the QR code was that it is simply the Web 2.0 way to contact a company by capturing email, phone number, or web site address. But I discovered that this was a narrow view: QR codes have much more depth and range of use, which means more creative and flexible ways to reach and drive prospects towards action. Ironically, the major place you’ll find QR codes is in the real world, but the only way you can use a QR code is online .Which leads me to an assessment of how QR codes play out in reality with the general consumer: tepid at best. For now. It seems that the audience intended for all the QR hype is lagging behind marketers, except for the tech-savvy and Gen Y’ers, It is second nature for them to click away anytime, anywhere. Several surveys I’ve seen confirm this: only about half of Americans have even heard of a QR code; and less than 30% have downloaded QR readers to their smart phone. Many times when I see a QR code, explicit instructions spell out what to do, as in “Scan this code into your phone with a QR code reader”. When QR codes become more commonplace and phones start having built-in readers, I suspect their usage will be much more common. More survey results here. So what are some of the benefits of QR code usage in marketing campaigns? They can certainly help accelerate how and when prospects capture information they might not otherwise. Say a woman is walking by a billboard featuring a gorgeous purse (for man insert cool electronic gizmo here) the person begins salivating but doesn’t have time to write the name of the brand or anything other information. Just point a smart phone at it with the QR reader and Shazam! – capture all the data from the QR code. Another great and timely characteristic of QR codes is that they are “green” without even trying. Just as printed brochures have become dinosaurs in the digital age and with our heightened awareness of natural resources, QR codes fit well the mindset of our time. Picture yourself driving by a house for sale that piques your interest. Instead of seeing the typical For Sale sign with a rack of house flyers, the sign only contains a big QR code. You lean out the car window and scan it, which takes you to a video of a virtual house tour, along with all its stats and price. Nice. And when it comes to QR codes, creativity has no limits: get entered into a sweepstakes, download a coupon, become a Facebook fan, make a purchase, and that’s just scratching the surface. Speaking of surfaces, you can put a QR code on pretty much anything-paper, clothing, glass, and plastic, to name a few. I even saw photos of a QR code on an apple and cupcakes too. Yum. You can also create patterns that spell something out (BBC does a cool one) or suggestive of an exotic hotel destination (palm trees) or apply different color patterns. Which is exactly the beginning of the downside of QR codes: even though the interest, cool, and fun factor is high, the intent of the QR code is not always obvious. Consumers may be able to identify a QR code but they don’t necessarily know what they’ll get when they do scan it. Some QR code destinations are obvious, but others are clear as mud. 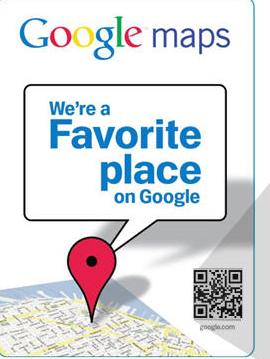 An example of this is Google’s “Favorite Places” program. Members of the program place the promo sheet in their restaurant window to display their Favorite Places “status” on a map grid with a large QR code. But if I were walking by, I’m not quite sure what information I’d get by scanning the QR code. It turns out it’s reviews of restaurants, but for me, and I suspect others, that is not intuitive. Prospective diners will still need directing, and that’s a problem for a split second decision-making that often occurs for us humans (research shows it takes us about 3 seconds to determine if we are interested in an advertisement, for instance). Sometimes consumers like to be surprised, but not when they are on an information-seeking mission. But the bigger question about QR Codes is whether the technology driving the marketing or the other way around? In other words, are we being blinded by a shiny new object? QR codes are an impactful tactic that can be used as part of a campaign, but building a program around one is more of a novelty and will wear off. In other words, there has to be some marketing beef to a campaign, not just sizzle. And likewise, dropping in a QR code into a marketing campaign can’t just be an afterthought. It has to be well-integrated to make sense to the reader and add value to the message. There is no doubt that the newfound use of QR codes adds a whole new dimension, literally, to marketing and is a great way to move the prospect through the interest and engagement level quicker. But at the end of the day, QR codes are essentially a mechanism to drive the prospect towards a call to action – otherwise it’s about as effective as a bunch of squiggly line in a box. Interesting post, I’m seeing QR codes more and more. As a B2B marketer targeting large companies with an enterprise software solution, I can’t see me using them in the near future. Love the images you added here BTW. Well-written and informative piece. I give it two years before QRs hit the mainstream — and take comfort knowing the coding will be firmly planted in our phones & NOT on our foreheads.